The reason we chose this vacation is because we had a friend who did it and loved it! The cruise was very reasonable, about $1200 a person. New York was a bit more expensive, but worth every penny. The total of everything was about $6,000 or so. I am sure it could have been done cheaper as well. We splurged! Wow! What a trip. 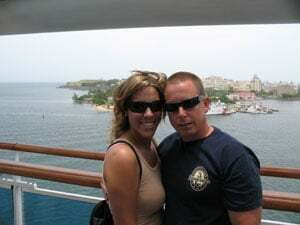 We left on May 24, 2008 for the busy city of New York. All the stories about the hustle and bustle are very true. When we arrived in New York at JFK, you can't help but stare at everyone and pay close attention to the way they talk! :) We stayed in New York for 2 nights at the Hilton in Midtown (so close to everything) before the cruise so we could take advantage of the sights and scenery. The next day we walked and walked and walked. I have never walked so much in my entire life! We saw the Empire State Building, shopped in SoHo, ate true Italian food at Il Cortile in Little Italy, rode the incredible subway, walked all through Central Park, checked out Spanish Harlem and so much more (yes, that was all in one day!). The following day, we headed to "Red Hook Pier" in Brooklyn and boarded our Princess Cruise ship where we headed into two days of wonderful bliss. The first 2 days are at sea where you can sit by the pool, relax and have a cocktail or eat all day! We attended a few of their many shows on board. The shows are amazing and they place a lot of effort into planning fun shows for the "cruisers". The third day out, we docked on the island of San Juan, Puerto Rico. Hot and humid but beautiful, we toured all around old and new San Juan. Lots of little quaint shops and cobblestone streets. Visited "El Morro" fort in Old San Juan where we pictured what it would have been like to be up high watching the boats coming in. We shopped and even picked up a purse at the Coach Factory store for me!. We had a nice authentic dinner at a little outside restaurant and tried their smashed fruit bread. Quite yummy, I thought! The next day we docked on the beautiful island of St. Martin. We had our day cut out for us. We were going to take a boat out of the harbor the Shipwreck's Cove and go snorkeling. When we got to the cove, it was amazing. The water was so crystal blue, even clearer than Hawaii. We got off and jumped right in to the warm soft ocean water. Nothing like here in the states, something you can only feel to believe. We snorkeled for about 2 hours and saw all of the abandoned ships and boats in the water. Apparently, after Hurricane Luis in 1995, the reefs were wiped out. The reefs provide a home for all the fish, so some of these boats were brought in to act as a replacement. Even so, it is so amazing. I have never seen anything like it. 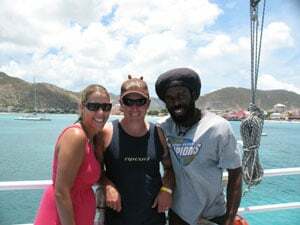 After a few hours with our "Rasta" guide we headed back to shore where we shopped again in the little Dutch town of Philipsburg. The island is divided up between the French and Dutch. How they divided it, I am not sure, apparently the French side (Marigot is the capitol) is much pricier than the Dutch side. The history itself is very interesting. After lunch and a walk around the shops, we were back again on the boat headed for our next location, St. Thomas. The following day we strolled into St. Thomas around 1:00 p.m. where we were told to visit Magen's Bay Beach. We walked off and grabbed a taxi headed for the bay. So peaceful and so serene surrounded by palm trees and lush mountain sides. After a few hours of sun bathing, we headed off to town where we had lunch and a few margaritas. Our next destination was Grand Turk. We were told that the island consisted of only 3,000 people and that the island was about 7 miles or so long. We couldn't wait! They also said that once we got off the ship, we would probably be done shopping in about 20 minutes! The water was so clear and the sand as falls across your skin like silk. We bid farewell to our island for the day and once again boarded the ship but we still had 2 more days left at sea to really relax before we were back into the hustle of New York. We had 4 days to see it all in NYC! 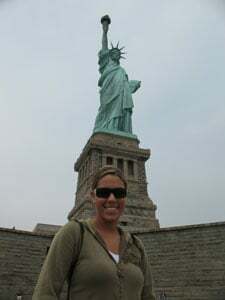 We visited the famous "Liberty Lady" and Ellis Island. There is so much history that came in and out of Ellis Island, so many stories and it's where so many lives took place once they walked out those doors. We had dinner in Greenwich Village at a little Spanish restaurant named "El Charro Espanol". The food was so delicious and so savory! My mouth is watering just talking about it! Of course we visited Times Square and couldn't help my head starring straight up to the sky. I was told that you could tell who the tourists were; they were the one's looking up the whole time and not looking where they are going! We visited 1 Police Plaza where we saw the Police museum that contained various artifacts from the different areas. That same day we visited the World Trade Center site. I found that it hit close to home even though I didn't personally know anyone affected by it. That was definitely a highlight on our trip. Before we left home, we set up a Yankee game. 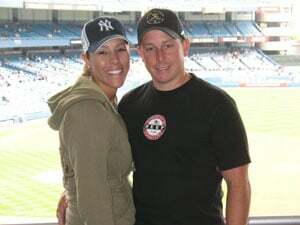 We took the subway up from Manhattan to the Bronx and went to the "Stadium that Ruth built" and enjoyed a game in their last season in this stadium. The new stadium which is across the street is going to be such an upgrade, not as much history but it's huge! We were in for a nail biter. The Yankee's played the Toronto Blue Jays and the Yank's were down one run in the 9th inning. Alex Rodriguez got a base hit and was on first base when Jason Giambi came up to bat. Giambi had 2 strikes on him and on his last ball, he hit a homerun! The crowd went absolutely wild and the Yankee's won the game 8-7. You could hear cheers and watch complete strangers hug in utter joy. That was a treat! The next day we decided to take a little trip through Brooklyn to Coney Island. A heat wave had hit New York the weekend we were there so we were in for a surprise. It was 96 degrees and extremely humid. It felt as though you stepped out into a sauna, so needless to say Coney Island was packed! So many bodies on the beach and so many people waiting in line for a hotdog at the famous Nathan's. The line was too long, so we settled for a burger at a little boardwalk joint. Not so good, but it satisfied the hunger. We took our long ride back to Manhattan and shopped for little last minute souvenirs. That was our last full day and it was gone in a "New York Minute" literally. Boarding the plane, I sat and thought about all we had done. Now that I am back to work and typing this, reminiscing, I can see myself lying on the beach in Grand Turk or walking down the cobblestone road in Puerto Rico or even running to catch the subway! What a great honeymoon and everlasting memories. Something to cherish and pictures that can never be replaced! I would recommend our vacation to all that want to explore history but enjoy relaxation at the same time.